Provides the ability to generate code-behind files for .vsixmanfiest and .vsct files in managed code to make the information easy to consume from the rest of the extension. 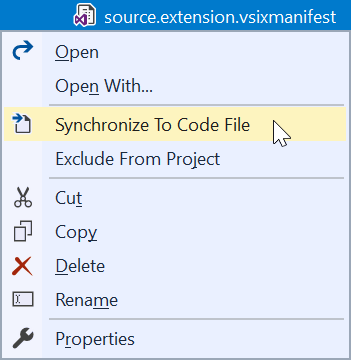 To enable the synchronization of .vsct and/or .vsixmanifest files, simply right-click the file in Solution Explorer and hit Synchronize To Code File. It will apply the VsctGenerator for .vsct files and VsixManifestGenerator to .vsixmanifest files. 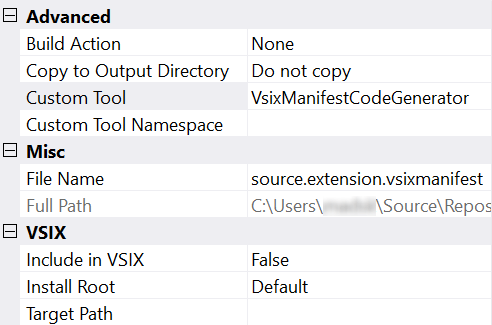 A code-behind file is then being generated and kept up-to-date with any changes to the .vsct or .vsixmanifest files. /// Helper class that exposes all GUIDs used across VS Package. /// Helper class that encapsulates all CommandIDs uses across VS Package. Now you can consume those GUIDs and IDs from the .vsct files and the metadata about your extension from the .vsixmanifest files.